Using MSDN's How to: Create Item Templates as guideline, I'm going to create two Item Templates - a standard NUnit test class and one that addtionally includes Setup and Teardown methods. 1. 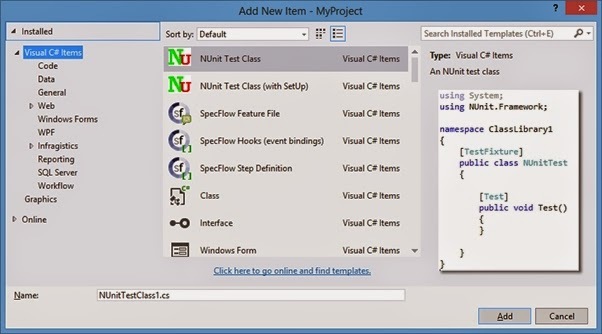 Create a new Visual Studio project (it doesn't matter which type as we won't be compiling anything). I've called my project NUnitTemplate. 2. Add a reference to NUnit or run Install-Package NUnit into Package Manager console. This 'class' looks familiar, but it includes a number of template patterns which Visual Studio replaces when it creates the class. More examples of standard template pattern items. 5. 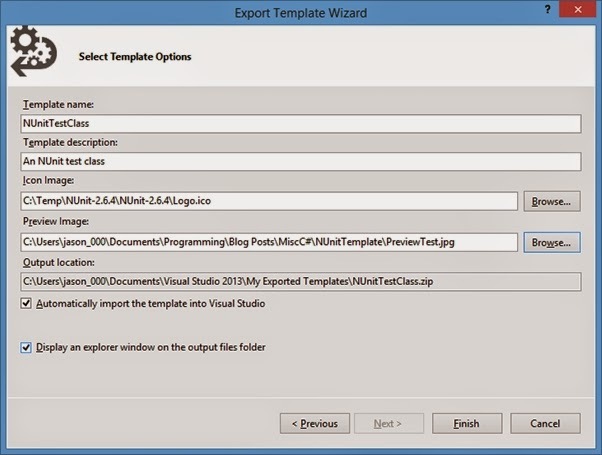 From the File menu choose Export Template. 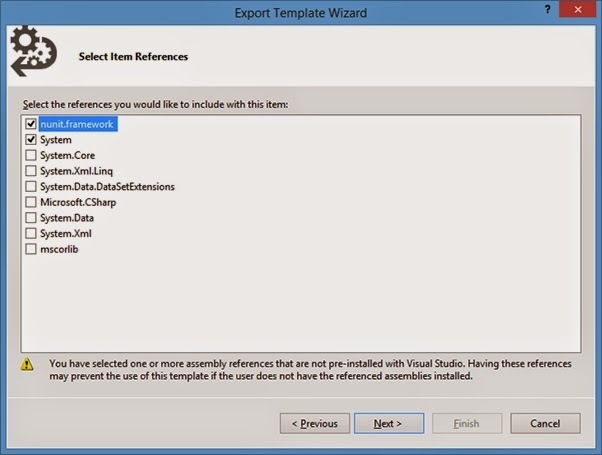 This starts a wizard that automates the steps required to create a zip file containing your template file, icon, preview image and description for Visual Studio. This file is placed into a specific folder which VS reads at start-up. 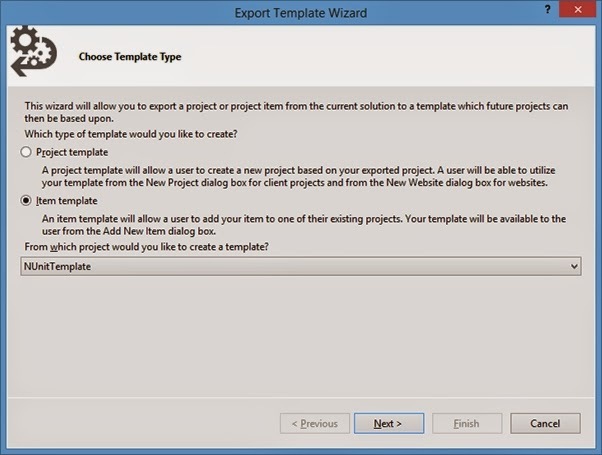 Choose Item Template as we're creating a new Item, rather than a Project template. You should see only one project listed if you created a single project - NUnitTemplate in my case. Click Next. 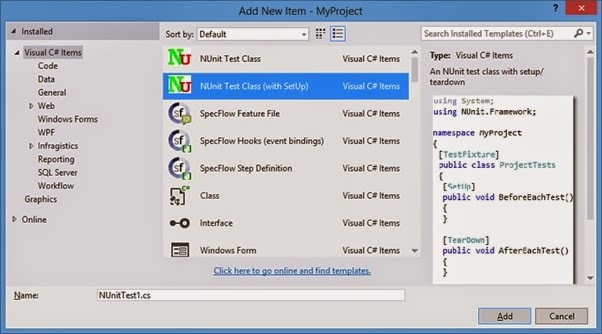 Select the item template that you've just added (NUnitTestClass.cs) and click Next. 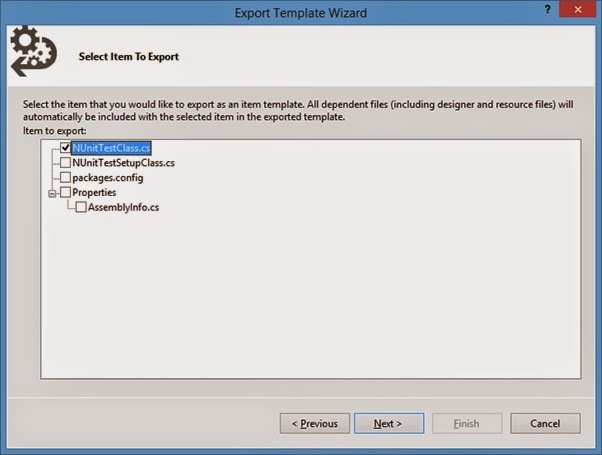 Template Name is used to create the destination Zip file. Template Description is shown in right hand pane. Preview Image is shown in the right hand pane. You need to ensure this is no more 200 pixels wide otherwise VS will compress it to fit into the screen. That's all the automated steps done. Change the DefaultName attribute and save the ZIP file (remembering to copy the Zip file to your My Exported Templates if you're using that folder as the original source). If you feel like following these steps, the final .ZIP files can be downloaded from my site and saved to your Documents\Visual Studio 2013\Templates\ItemTemplates folder. Great post. Keep sharing such a topic.